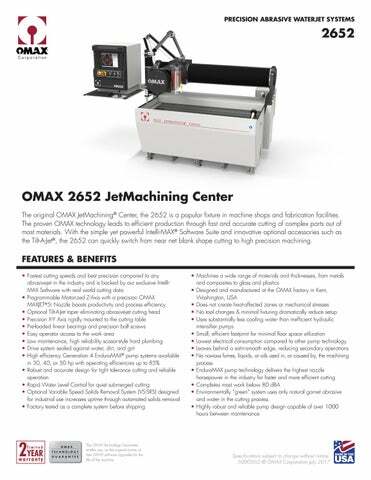 OMAX 2652 JetMachining Center The original OMAX JetMachining® Center, the 2652 is a popular fixture in machine shops and fabrication facilities. The proven OMAX technology leads to efficient production through fast and accurate cutting of complex parts out of most materials. With the simple yet powerful Intelli-MAX® Software Suite and innovative optional accessories such as the Tilt-A-Jet®, the 2652 can quickly switch from near net blank shape cutting to high precision machining. ABOUT OMAX OMAX is the global total solutions provider in advanced abrasive waterjet systems. Our intuitive Intelli-MAX Software Suite simplifies programming and reduces setup times, increasing your productivity. OMAX engineers continue to innovate technology for abrasive waterjet machining, from proven 4th generation pump designs to cutting edge drive systems with micron-level accuracy. With the largest abrasive waterjet support network in the world, OMAX continues to shape the future of waterjets. To see how an OMAX JetMachining Center can save you time and money, call or visit our website and request a free part analysis today.